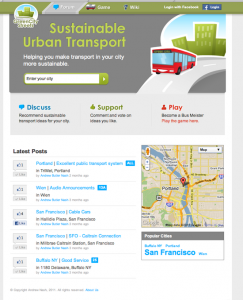 I’ve been working in the field of using Web 2.0 techniques to help make transport more sustainable for several years. This post is adapted from my Blogger Blog written in 2011 when we launched the GreenCityStreets.com website. Bus Meister is a prototype for the Green City Streets project. It combines a game (to attract and teach), a social network (to encourage political action) and a best practices wiki (for those who want to learn more). If Bus Meister is successful we will create similar programs for other modes of transport under the same Green City Streets website. We welcome your comments and ideas!